People in America, a program in Special English on the Voice of America. Today, Shep O'Neal and Warren Scheer finish the story of civil right's leader Martin Luther King, Junior. his university studies when he was fifteen years old, and received a doctorate degree in religion. He became a preacher at a church in Montgomery, Alabama. In nineteen fifty-five, a black woman in Montgomery was arrested for sitting in the white part of a city bus. Doctor King became the leader of a protest against the city bus system. It was the first time that black southerners had united against the laws of racial separation. At first, the white citizens of Montgomery did not believe that the protest would work. They thought most blacks would be afraid to fight against racial separation. But the buses remained empty. Some whites used tricks to try to end the protest. They spread false stories about Martin Luther King and other protest leaders. One story accused Martin of stealing money from the civil rights movement. Another story charged that protest leaders rode in cars while other protesters had to walk. But the tricks did not work, and the protest continued. Doctor King's wife Coretta described how she and her husband felt during the protest. She said: "We never knew what was going to happen next. We felt like actors in a play whose ending we did not know. Yet we felt a part of history. And we believed we were instruments of the will of God". The white citizens blamed Doctor King for starting the protest. They thought it would end if he was in prison or dead. Doctor King was arrested twice on false charges. His arrests made national news and he was released. But the threats against his life continued. The Montgomery bus boycott lasted three hundred eighty-two days. Finally, the United States Supreme Court ruled that racial separation was illegal in the Montgomery bus system. Martin Luther King and his followers had won their struggle. The many months of meetings and protest marches had made victory possible. They also gave blacks a new feeling of pride and unity. They saw that peaceful protest, Mahatma Gandhi's idea of non-violence, could be used as a tool to win their legal rights. Life did not return to normal for Doctor King after the protest was over. He had become well known all over the country and throughout the world. He often was asked to speak about his ideas on non-violence. Both black and white Americans soon began to follow his teachings. Groups were formed throughout the south to protest peacefully against racial separation. The civil rights movement spread so fast that a group of black churchmen formed an organization to guide it. The organization was called the Southern Christian Leadership Conference. Martin Luther King became its president. 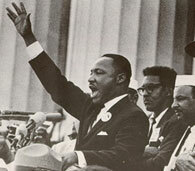 In his job, Doctor King helped organize many protests in the southern part of the United States. Blacks demanded to be served in areas where only whites were permitted to eat. And they rode in trains and buses formerly for whites only. These protests became known as "freedom rides. " Many of the freedom rides turned violent. Black activists were beaten and arrested. Some were even killed. In nineteen sixty-three, the black citizens of Birmingham refused to buy goods from the stores in the city. They demanded more jobs for blacks. And they demanded to send their children to white schools. The white citizens were angry and afraid, but they refused to meet the blacks' demands. The situation became tense. Many protestors were beaten and arrested. Even Doctor King was arrested. But he was not in prison for long. The Birmingham demonstrations made international news. Whites soon saw that it was easier to meet the demands of the protestors than to fight them. Martin Luther King and his followers had won an important victory in Birmingham. It marked a turning point for the civil rights movement. 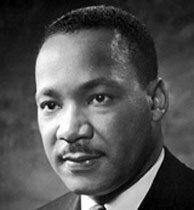 Martin Luther King recognized the importance of Birmingham. It did not mean that racial separation had ended. Some still remains today. But he felt that the battle was almost won. And he wanted to call on the nation for its support. So doctor king organized a March on Washington, D. C.
hundred fifty thousand persons gathered there. They came to demand more jobs and freedom for black Americans. There were to be many other marches in Washington during the nineteen sixties and early seventies. But this was the biggest up to that time. Martin Luther King received the Nobel Peace Prize in nineteen sixty-four. But he did not live to see the final results of his life's work. He was shot to death in Memphis, Tennessee, in nineteen sixty-eight. You have been listening to the story of civil rights leader Martin Luther King, Junior. This Special English program was written by William Rodgers. Your narrators were Shep O'Neal and Warren Scheer. I'm Doug Johnson. Listen again next week at this time for another People in America program on the Voice of America.